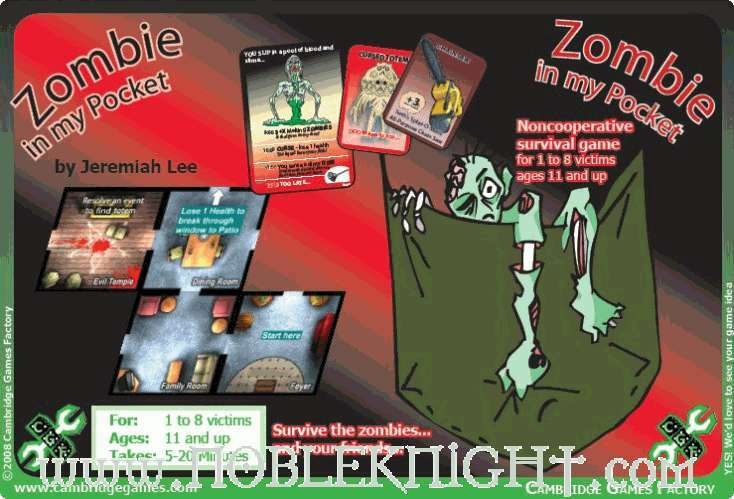 Before I began reviewing for Cambridge Game Factory, I knew about Zombie In My Pocket. It was a free print-and-play game you could download at Board Game Geek, a solitaire game where you run around a house full of the undead and try to stave off the zombie apocalypse by burying an evil totem in the graveyard installed behind the storage shed. Cambridge bought the game, and added rules to turn it into a multi-player game, which I must say, is way more fun. So I liked the solitaire game, and was pretty excited to try the version where you brought several of your closest friends along to get eaten by the walking dead. And I was right to be excited, because what was a clever solitaire game becomes a hilarious romp when you play with more people. Because if you all die, you all lose, but if you succeed at stopping the apocalypse, only one of you wins. And that makes it the back-stabbingest cooperative game ever. For the most part, when you're playing Zombie In My Pocket, you take turns being the leader and wandering around the house. But when zombies jump out of the refrigerator or from underneath the sofa, you individually choose to run away or fight. If you fight, you could get hurt. If you all run, you all get hurt a little. But if some of you fight and some of you run, the chumps who stuck around are going to have zombies gnawing on them like steak dinners, and you'll actually get healthier. The reason this is so terrifically nasty is because if you do manage to bury the totem in the graveyard next to the swingset (that's where the graveyard is in the game, though I suspect that all the other people who have graveyards in their back yards put them by the hibachi), the player with the most health wins. If you can manage to kill off everyone else and still defeat the zombies at the end, you get to gloat at your horribleness as you celebrate your victory. Of course, all this treachery and cowardice plays best with other people who are willing to turn into limp-spined jellyfish at the drop of a hat. If you play with a bunch of people who are all ready to man up and take their licks, then you're probably going to win and they're all going to call you the kinds of names usually reserved for creatures you might dig up in your garden. It's fun to win, but if everyone else says you're a crotch-sniffing weasel, it does kind of deflate your victory a little. But then, if they had any sense, they would have run away that one time when you chainsawed four zombies all by yourself, and let a couple of them chew on your face. I like the kind of base and dishonorable turncoatting that games like Zombie In My Pocket can generate, and I don't think I've ever played a game more outright treacherous. That's why it's so fun. But if you like your games a little more honest, and if you can't bring yourself to betray your friends for personal gain, you will probably not have any fun at all. And if you play this game with a trusting five-year-old, you will almost certainly leave psychological scars that may never heal. So the mass-market version of Zombie In My Pocket is a fun game, but as the third Cambridge Games Factory production that I've reviewed, it continues to drive home one core point - those guys desperately need to hire an adequate graphic designer and spring for some art. This game is fun, but it is brutally ugly, and not just because there are zombies in it. The first step in improving every game from CGF would be to remove the 'gradient' button from every piece of software their current artist owns, and the second would be to throw their clip art collection into the landfill full of toxic waste and used rectal thermometers. You know, so they wouldn't be tempted to go get it back. If your eyes can handle the assault and your friends can handle your self-serving betrayal, you'll get a kick out of Zombie In My Pocket. It's light, mean-spirited fun that will leave you laughing as you worm your way to the finish line. As long as you don't take it too seriously, and try to get all noble or some other silliness, Zombie In My Pocket is a half-hour of evil giggles that you'll want to play again. So glad you enjoyed the game, and played it cut-throat. It's supposed to be -non- cooperative!